The Lower Sugar River Watershed is divided into 13 subwatersheds as shown on the map below. Each subwatershed feeds into the Sugar River. The subwatersheds range in water quality from impaired to listed as Exceptional Resource Waters. One focus of the LSRWA is to improve the quality of the impaired subwatersheds. The first step in this process is to sample the water to establish some baseline data. Monitoring work for this effort has already begun through our Citizen Science programs. If you live in one of the subwatersheds, please consider getting involved in helping to make a difference in your own backyard! For more information on each Subwatershed, click the link on the left side of this page. 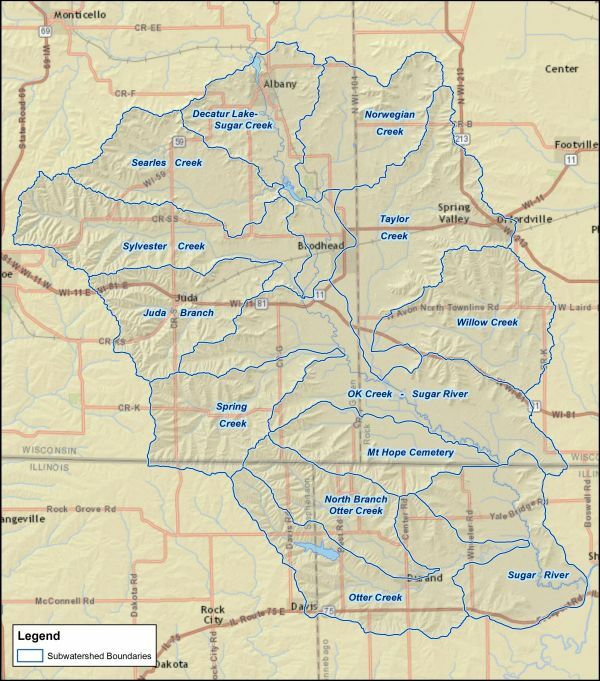 Subwatershed Maps in PDF format are shown in the table at the bottom of this page.